(P1) Efforts to increase Internet access worldwide are falling short of goals, according to a United Nations Broadband Commission report released earlier this week. (P2) More than half the world’s population is still offline, according to the report, and growth in the number of people with access to the Internet is slowing. (P3) The digital divide has become a CHASM. (P4) Internet access in rich economies is reaching SATURATION levels, while about 90 percent of the people in the 48 poorest countries have none, the report notes. It appears that a backward trend in Internet access is taking shape. This year’s projected growth rate of 8.1 percent represents a drop from 8.6 percent last year, and a downward TRAJECTORY from the strong growth seen until 2012. (P5) “The Internet in many countries is still seen as a PRIVILEGE and not a basic human right,” said Clair Jones, technology and broadband expert. (P6) “INFRASTRUCTURE is limited and needs to be expanded, but the real BARRIER TO ENTRY is cost. For Internet to truly be available across the globe we, as a planet, would have to decide that digital equality is important enough to make Internet a public utility. We would need to significantly lower costs or make the Internet free for UNDERDEVELOPED countries,” she told TechNewsWorld. (P7) Broadband access is critical for any country’s economy, whether it’s a new or an old economy, observed Anurag Lal, CEO of Infinite Convergence Solutions. (P8) It has a direct link to the competitiveness of a country’s workforce, he said. (P9) “The Obama administration, as well as previous U.S. administrations, understood the importance of developing broadband. They believed it was a utility that has to be encouraged,” Lal told TechNewsWorld. (P10) One approach to reversing the approaching FLATLINE of broadband access could be a mobile and satellite broadband push. That could allow governments to bring service to rural areas that currently do not have access to infrastructure and likely will not in the near future, noted Jones. (P11) “I would expect that we could bring broadband connection to most parts of the world by 2030,” she said. (P12) Nearly 3.2 billion people — about 43.4 percent of the world’s population — will have some form of regular access to the Internet by this year’s end. That figure is up from 2.9 billion last year, according to the UN report. (P13) The commission’s goal is to see 60 percent of the world’s population wired to the Internet by 2020. (P14) “The world is a big place, and the BUSINESS MODEL has to make sense. Most [people in] THIRD WORLD countries do not have the income to support an Internet account,” said Michael Bremmer, CEO of TelecomQuotes.com. (P15) “When you are worried about food, Facebook really is not that important,” he told TechNewsWorld. (P16) For example, a mobile data plan in Brazil costs about 10 percent of average wages, he said, and in Africa a mobile data plan costs about one-third of average wages. (P17) About 300 million people gained Internet access in the past year. But some 57 percent of the world’s population — more than 4 billion people — still do not use the Internet regularly or actively, according to the UN report. (P18) LANGUAGE BARRIERS in some regions made it difficult for people to use the Internet even in areas where the technology was present. The world’s residents speak about 7,100 languages, but just 5 percent of those languages are represented online, the report notes. (P19) “Even if we expand infrastructure and lower costs to make the Internet AFFORDABLE for all, there is still the difficulty of providing translation of the world’s languages so that the information is accessible for all,” Jones said. (P20) The top 10 countries for household Internet PENETRATION are in Asia or the Middle East, according to the UN Commission’s report. For example, the Republic of Korea continues to have the world’s highest household broadband penetration, with 98.5 percent of homes connected. Close follow ups are Qatar with 98 percent and Saudi Arabia with 94 percent. (P21) In contrast, the lowest levels of Internet access are mostly found in SUB-SAHARAN AFRICA. The Internet is available to less than 2 percent of the populations in Guinea, Somalia, Burundi, and Eritrea. The only solution in these regions is to tackle the cost of physically extending broadband infrastructure with the latest advances in satellite technology, the report suggests. (P22) The most encouraging possibilities for spreading Internet access across the globe lie with more affordable technologies. (P23) Google and Facebook already are trying to IMPLEMENT Internet solutions. Their approaches may give governments a less costly way to create a broadband infrastructure. (P25) Both companies have met with some success in LEAPFROGGING broadband challenges to bring the Internet to the populations where nobody else has done it, he observed. (P26) “Both are for-profit companies, so they want to get people to the Internet to reach their services,” Lal pointed out. (P27) How connected the Earth can become depends on one’s definition of “connected.” If it means connecting every corner of the globe, that probably will never happen, said Bremmer. (P28) Even after the broadband infrastructure is expanded, efforts will need to focus on making the service affordable and available to both men and women everywhere, said Jones. 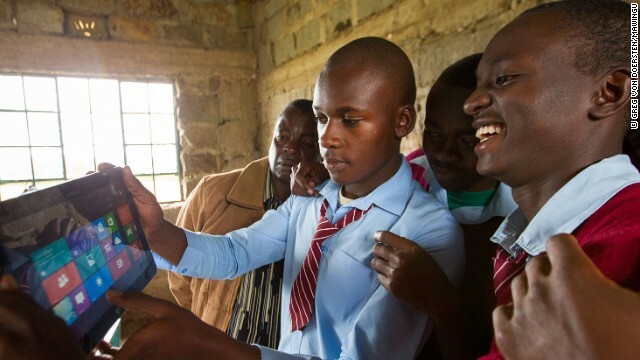 Why is Internet access important for poor people in underdeveloped countries? Are the major challenges to worldwide Internet technical, financial, or both? Should Internet access be partly a government issue, or purely a private business issue? Why do you think South Korea has almost 100% Internet penetration?